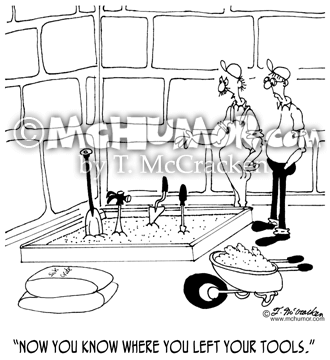 Cement Cartoon 6350: Looking at tools stuck in a cement foundation a man says to another, "Now you know where you left your tools." 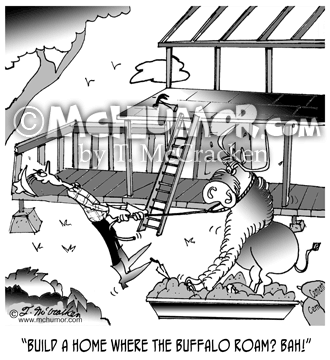 Architecture Cartoon 4385: Buffalo running through a construction site and a man saying, "Build a home where the buffalo roam? 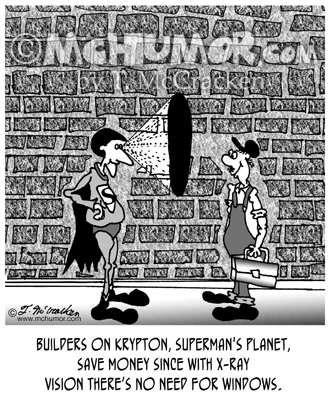 Bah!" 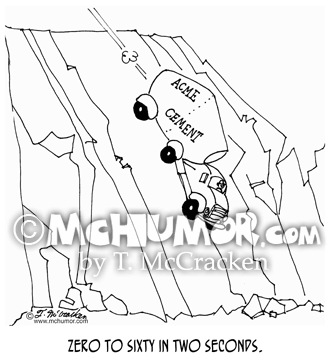 Truck Cartoon 6090: A truck falling off a cliff. 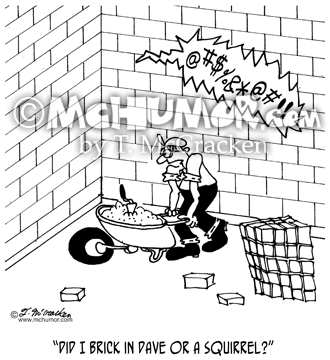 "Zero to sixty in two seconds." 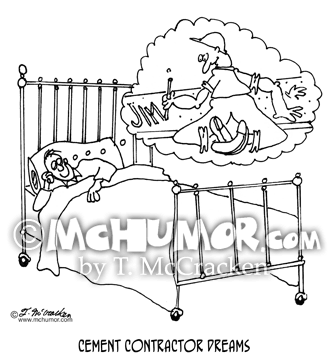 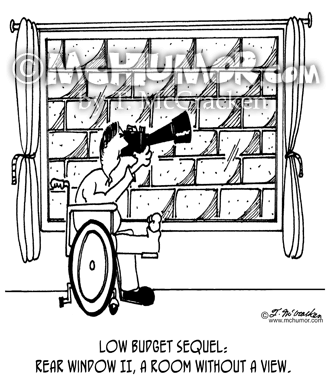 Cement Cartoon 6150: "Cement Contractor Dreams." 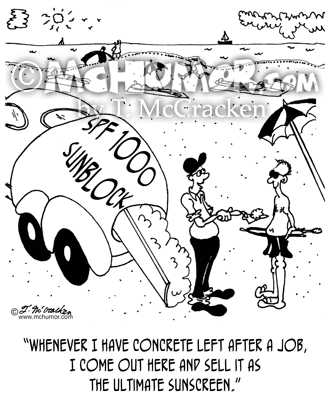 A man sleeping dreams of himself writing his name in a sidewalk's wet cement. 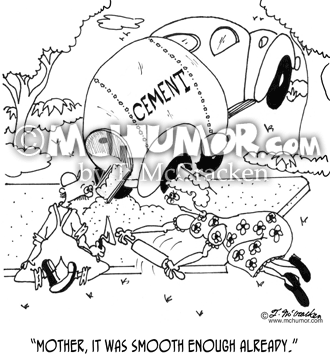 Cement Cartoon 6367: As a woman smooths out freshly laid cement with a rolling pin a mason says, "Mother, it WAS smooth enough already." 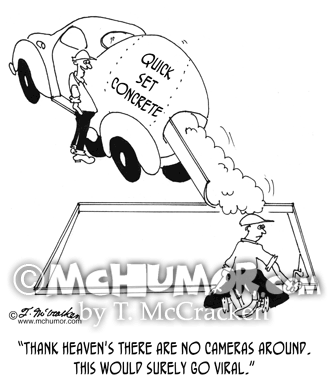 Concrete Cartoon 6151: A man about to dump a load of cement from a truck on an unaware worker says, "Thank heaven's there are no cameras around. This would surely go viral." 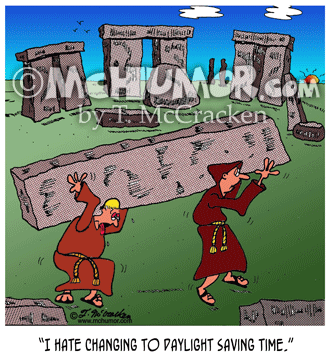 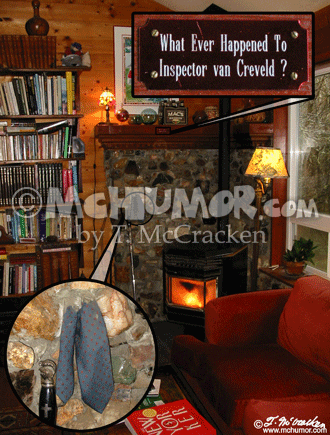 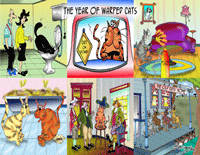 Rock Cartoon 8355: A tie is mortared into a stone hearth that has a plaque on it that says, "What ever happened to Inspector van Creveld?" 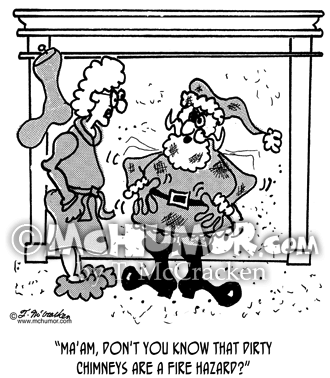 Fire Cartoon 2299: A sooty Santa in front of a fireplace says, "Ma'am, don't you know that dirty chimneys are a fire hazard?"